One of the outstanding traits of white beans is their creamy texture. Why not accentuate that creaminess by turning them into a creamy soup? It’s delicious and satisfying — almost decadent. This recipe calls for dill but you can substitute fresh basil or use a dill and mint blend. Parsley and chives are a tasty duo as well. Fresh herbs are best, of course, but good quality dried herbs will enliven this creamy bean soup quite nicely. I begin soups like this with beans that are already cooked and seasoned with salt and pepper. The cooking broth for the beans is a bone or vegetable broth broth that increases the nutrition and adds flavor. Always plan on the beans being delicious before adding any soup ingredients so that you are half way to a great soup. Feel free to replace the Parmesan with any hard, salty cheese. The sharpness of the cheese plays so well with the creaminess, almost sweetness, of the soup. This recipe produces four generous bowls of soup. The soup becomes a full meal when you add something like leftover bits of cooked meat like chicken or pork. 2 tablespoons thickener of choice — potato flour, arrowroot, etc. Warm the broth to a simmer in a large soup pot over medium heat. Add the wine if using that option. The wine, cream, and dill make a lovely flavor combo. Alcohol from the wine will be cooked out by the time the soup is ready to serve. Stir the cooked beans into the hot broth and bring it all back to a simmer. Mix the thickener into the cream breaking up all lumps. Slowly drizzle the cream and thickener into the hot soup, stirring the whole time. Stir until the thickening process is complete, about 2-3 minutes. Turn off the heat. Taste for salt and pepper. Make any necessary adjustments, remembering the saltiness of the cheese that has not yet been added. Stir in the minced dill weed. Let the pot sit for about 10 minutes for the soup flavors to blend. 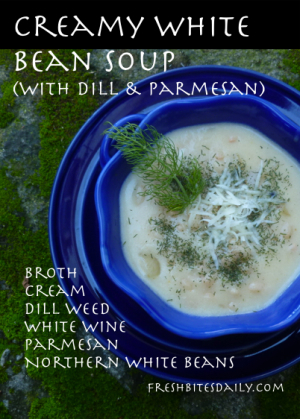 Ladle your creamy bean soup into warmed bowls and garnish with grated Parmesan and dill sprigs. One option is to garnish with just the dill and pass a bowl of grated Parmesan for folks to add as much of the cheese as they might like. I have two little grandsons who add enough to turn this recipe into a cheese chowder. That’s good, too! Leftovers hold well for about three days in a tightly closed container in the refrigerator. Take a thermos of this soup to work and your lunch buddies will be drooling. 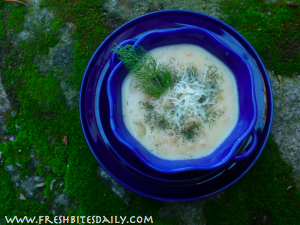 1 Comment on "Creamy White Bean Soup with Dill and Parmesan"
This looks really appetizing. Perfect for the cold weather.